What’s better in the summer (or any time for that matter) than a good old hamburger? When cooked to perfection, a burger is one of life’s great All-American pleasures. And as much as I love (and I mean really, really love) beef, I know that it’s not the healthiest thing for me. So every once in a while we have Turkey Burgers instead of that good old beef burger. And they’ve been pretty good. However, you probably know that they can usually be somewhat dry, but I just wrote that off to it being turkey with little to no fat. That is, until I found this recipe! This has to be the ultimate turkey burger. It’s flavorful and moist. It holds its shape well and is just excellent. Place all the ingredients in a large bowl. Mix well using a fork rather than your hands to help keep the mixture from becoming too compressed. Form into four patties. Note: this makes four very large patties. Cook over medium high heat (either on a grill or in a saute pan) approximately 6 minutes on the first side. Flip patties and finish cooking until internal temperature reaches 170 on a meat thermometer. Serve on toasted buns with your condiments of choice. I used mayonnaise, catsup, lettuce and tomato slices. You already have the cheese and mustard inside the burger! A delicious turkey burger seasoned with Gruyere cheese and Dijon mustard. 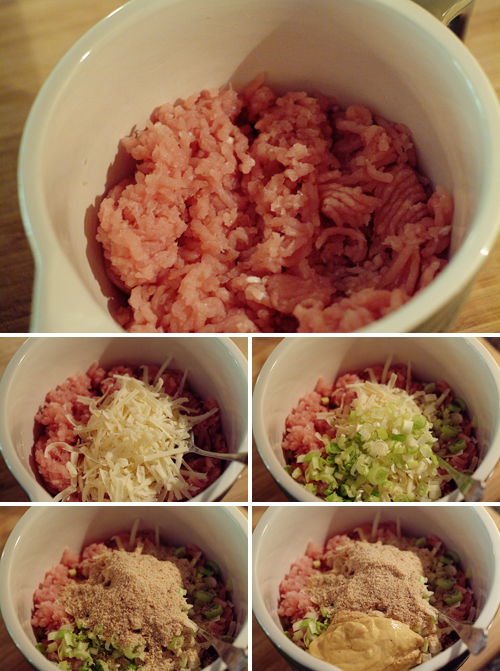 Place all ingredients in a large bowl. Mix well using a fork to help keep the mixture from becoming too compressed. Form into four patties. Note: this makes four very large patties. Serve on toasted buns with your condiments of choice. I used mayonnaise, catsup, lettuce and tomato slices. Nice turkey burgers and the pics are fantastic. Delicious looking burgers!! Pass me a cold drink with this and I’ll lounge away the day. Those look like delicious burgers. I could maybe even tempt my meat loving hubby with those! The gruyere cheese got my attention! And what a beautiful photo. Gorgeous photo. I’m having a turkey burger right now and it’s so delicious. Holy crap. Just made these incredible burgers. I got the recipe on Pinterest. They were absolutely delicious and moist. Thanks so much. Family loved them. Me too, Sues! Gruyere is just about my favorite cheese. So delicious.